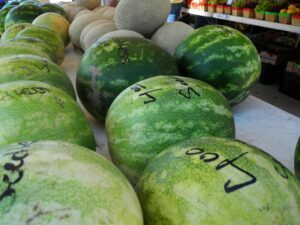 The new crop is in, spring is here, and the Frisco Farmers Market starts back up Sat, May 4th, with a bounty of freshness for Frisco! Come tempt your tastebuds in Frisco Square with all those who appreciate the “buy fresh, buy local” idea. With seasonal fruits creating a spectacular palette, the freshest vegetables in North Dallas will excite your culinary talents. 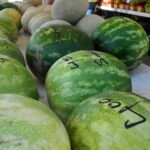 The Frisco Farmers Market was started to give growers and producers of North Texas alternative marketing and sales opportunities by delivering a variety of fresh and highly nutritional produce and by preserving our unique agricultural heritage. From just a few vendors during the 2007 launch summer, the Frisco Farmers Market has grown to almost 40 vendors. Find your choice of locally grown food and hand-made goods. So, what is “local?” When speaking of produce, local around here is about 100 miles around, and rules at the Farmers’ Market require farmers to grow at least 60% of what they sell. Most vendors are closer to 100%. Peruse pasture-fed beef, pork, lamb, and the freshest eggs you’ll find. Buy pasta, seafood, cheesecake, muffins, gourmet items, and honey—all fresh. 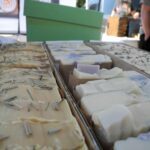 As the Farmers’ Market patrons an community members increase their interest in whole, organically-produced foods, the quality and quantity will follow. 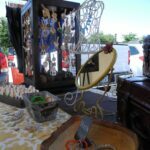 Patrons also love the arts, crafts and service offerings while at the Market. Handmade quilts, handcrafted jewelry, ceramics, crafts, essential oils, non-toxic lotions, face painting and natural pet foods and pet care services. 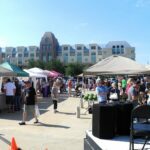 Be sure to stop by Frisco Square every Saturday morning for the best produce and homemade goods in Frisco. Every Saturday from May through October. 8:00am to 1:00pm or Sell Out.